Today, we are here to take a look at the BergHOFF Commercial Grade 1800 Watt Portable Touch Screen Induction Cooktop. It has all of the awesome features which you would expect a full sized cooktop to have, but in a small, portable, fast, and highly energy efficient package. Let’s take a few minutes now to do an in depth review. Induction cooktops have really changed the way in which we play the cooking game. Sure, many people still use good old coil stovetops and gas ones too, but those are starting to go out of style. The induction cooktop is a great option to consider for a variety of reasons. These things are extremely energy efficient, they tend to be fairly affordable, they stay cool to the touch and can’t burn you, and they usually work much quicker than any other cooktop alternatives. Now, add in the fact that induction cooktops like this one are totally portable, and you have yourself a totally powerhouse of a cooking tool. It’s like having the world’s fastest and most efficient portable hot plate, except it doesn’t get hot to the touch! BergHOFF is a big time brand name when it comes to things like induction cooktops. They are a really reputable brand name, mainly because they never fail to deliver high quality products at really affordable prices. The BergHOFF Commercial Grade 1800 Watt Portable Induction Cooktop is one of those affordable and functional items. If you are on the lookout for a really great induction cooktop, you should definitely check out this model. It has many advantages that come with it, ones such as being highly energy efficient, portable, cool to the touch, and much more. It has a ton of features that make cooking safe, easy, accurate, and quick. No longer do you have to deal with coils that take forever to heat up or gas stoves that waste a ton of energy. Let’s take a closer look at the BergHOFF Commercial Grade 1800 Watt Portable Touch Screen Induction Cooktop in order to find out what makes it one of the best induction cooktops on the market today. There is a whole lot to talk about when it comes to the BergHOFF 1800 Watt Portable Induction Cooktop, so let’s not waste any more time and get right to it. Without a doubt, one of the best features that this particular induction cooktop brings to the table is that it is extremely portable. Yes, you can use it as a replacement burner in your kitchen so you don’t have to use your full sized stove. It won’t take up very much counter space, which is definitely ideal for anyone who doesn’t have too much kitchen space to spare. On that same not, it is a great option for college kids and dorm rooms, for trips in your RV, and for your vacation cabin on the lake too. Being portable is always something that we like to look out for. Another feature about this model that we like is that it uses the standard 120 volts, 15 amps of electricity. In other words, you don’t need some special cord or outlet to plug this bad boy in. It will work in any standard electrical outlet. Just to give you some perspective, the cooktop is about 70% more energy efficient than a gas cooktop, which is great in terms of your electricity bill. There is also the fact that this particular induction cooktop is extremely fast acting. It can boil water in literally half the time as other conventional cooktops. Something else that we like about the BergHOFF Commercial Grade 1800 Watt Portable Touch Screen Induction Cooktop is that it has a really easy to use touchscreen control panel. Simply touch the buttons to select your settings and the cooktop will do the rest for you. You can use the touchscreen to set the temperature anywhere from 150 to 450 degrees. In other words, the temperature range is just as good as on any full sized kitchen cooktop. Going back to the energy efficiency thing, this model can detect the size of the cookware and match its energy output to that size, thus using energy as efficiently as possible. Moreover, the fact that the cooktop shuts off after it has not detected cookware for 60 seconds is another big energy efficiency factor. What you might also like about this portable induction cooktop is that it is cool to the touch. It only heats up the cookware you place on it, but will not add excess heat to the room and it won’t burn your hands either. This is also useful because it means that spills and over boiled liquids won’t burn and stick to the cooktop, thus making it very easy to clean. 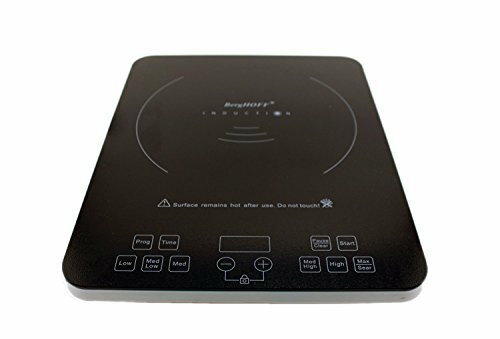 At the end of the day, if you are on the lookout for the best induction cooktop around, the BergHOFF Commercial Grade 1800 Watt Portable Touch Screen Induction Cooktop is undoubtedly a top contender. The fact that it is energy efficient is a big bonus for many people, plus its portability and space-friendly nature is useful too. This induction cooktop may be small and convenient, but it also packs a punch just like a full sized kitchen cooktop.